Apple cider is unfiltered juice from apples. In the United States, cider is referred to as sweet (unfermented and alcohol-free) or hard (fermented and contains alcohol). 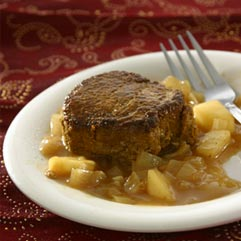 In this recipe, the sweet flavor of the apple cider and chopped apples nicely complement the pork tenderloin. Season the pork tenderloin with curry powder and let stand for 15 minutes. In a large, heavy skillet, heat the olive oil over medium-high heat. Add the tenderloin and cook, turning once, until browned on both sides, about 5 to 10 minutes. Remove the meat from the skillet and set aside. Add the onions to skillet and saute until soft and golden. Add 1 1/2 cups of the apple cider, reduce the heat and simmer until the liquid is half the volume. Add the chopped apple, cornstarch and the remaining 1/2 cup apple cider. Stir and simmer while the sauce thickens, about 2 minutes. Return the tenderloin to the skillet and simmer for the final 5 minutes. To serve, arrange tenderloin on a serving platter or divide onto individual plates. Pour thickened sauce over meat and serve immediately.